This pretty Sampler bag is a perfect introduction to Fair Isle knitting. In true form, only two colours are used at any one point and, being knitted in the round, you are not left with dozens of ends of yarn to sew it at the end. A relief to us, for sure! The kit contains 200g of wool in the main shade and 100g in the contrast colour. These kits come with a natural Kraft brown carrier illustrated by a large decorative Sheepfold label on the front and a photo label tied to the handle to show the finished bag; ideal as a gift either as a kit or as a completed item. 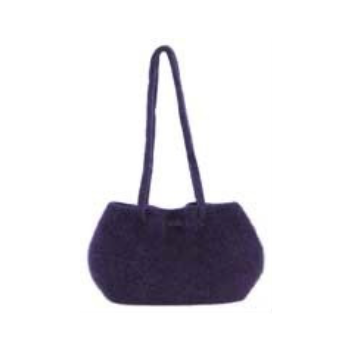 To knit this wonderful bag you will need a pair of 5.5 mm knitting needles and a 5.5 mm circular needle, not to mention an enthusiasm for British wool! The I-cord handles are knitted with 4.5 mm double pointed needles. Stitch markers and stitch holders are useful too. 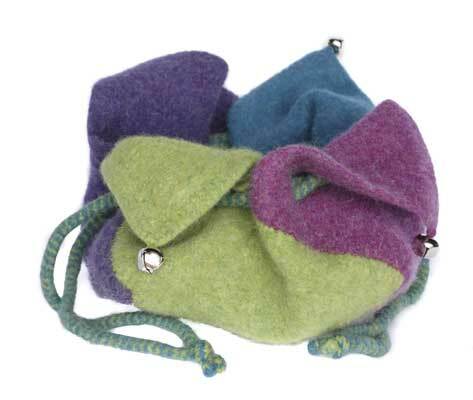 The ‘hard work’ of felting is easily done in your washing machine; such is the simplicity of knit-and-felt. The finished size of the example containing hand-dyed wool is approximately 25 cm x 29 cm x 13 cm (width x height x depth) depending on how far you take the felting process. For those wanting added security, a magnetic clasp or zip could be added at the top edge.